Instagram introduced its own Snapchat-inspired Stories feature in 2016. Facebook eventually followed suit, but its offering differed structurally and hasn't seen significant uptake by users. Snapchat's Stories feature has become an iconic form of social sharing. Without the customary components of social media like heart buttons, comment sections and posts that stay forever attached to your profile (unless you manually delete them), users are encouraged to engage in more casual and frequent posting of photos and short videos, which disappear after 24 hours. Stories: The Future of Social Media? Do stories represent the next major stage of how we share things with each other online? And how do we decide which platform to use for Stories now that there are two major options? 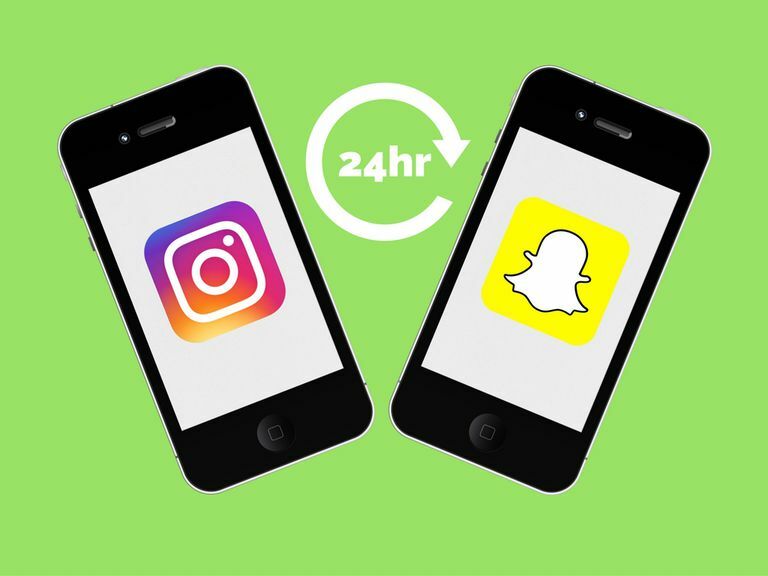 Your audiences on Instagram and Snapchat may differ, a relevant consideration when you're going to post a 10-second photo or video. The features of each platform present subtle differences, too. Instagram will almost certainly beef up its Stories feature given that it's recently been introduced, and Snapchat will probably do the same in order to compete, but for now, we're just getting started with seeing how the world might continue to embrace super casual, ephemeral content sharing. Let's explore a side-by-side comparison of the features that Instagram Stories now offers vs. what Snapchat Stories currently offers. On Instagram, you'll see a horizontal feed for Stories at the top of your main feed displaying profile photos as circled bubbles of users whom you follow. The bubbles you see will appear according to an algorithm that aims to show you your favorite account Stories first. Swipe left or right to scroll through them and tap to view a specific user's Story, which disappears 24 hours after it's been posted. Stories that you haven't viewed yet will be circled in color. On Snapchat, you have to swipe left from the camera tab to access your Stories tab. A vertical feed of recent updates and all stories featuring users you've added (including their photo, name and time they've posted) will be displayed between blocks of promotional content from Snapchat's partners. The Takeaway: Instagram's Stories feed is like a secondary feed that's been combined with the main one to compliment it as a quicker, more casual form of content sharing. Snapchat, on the other hand, is all about ephemeral content sharing, so it only has one form of content to share and is simply just mixed with partner content. On Instagram, you can tap the very first Story in your Stories feed to view it and it will play everybody else's Stories in the order they appear in your feed. If a user posted several Stories, they will play in the order that they were posted. You can tap any user's Story to just view theirs (rather than all of them in the order they appear in your feed) and you tap to skip through them quickly if your friend posted several Stories. There's also a "Send Message" option at the bottom of every Story, which you can use to start a chat through Instagram Direct. On Snapchat, viewing Stories is almost identical to what Instagram now has. Tap the first Story in your feed to watch what's been posted in the order they appear (including multiple Stories from a user) and tap to skip through them quicker. There's also a chat option that you can access on every Story that allows you to send a message or start a chat with that particular user. The Takeaway: When it comes to simply viewing Stories on Instagram and Snapchat, the experience is virtually identical. One interesting difference is the ability to rewind through Stories by tapping on the left side of the screen as you're viewing them—a feature that Snapchat doesn't have. Another subtle difference is that you have to swipe down if you want to stop watching a Story on Snapchat while on Instagram you have to tap the X in the top right corner to stop watching. The Takeaway: Snapchat offers more Story features than Instagram—most notably lenses and fun filters — but that will probably change very soon. On Instagram's side of things, however, the different sets of drawing tools and easy to use color options are a nice touch, which Snapchat doesn't currently offer. The Takeaway: Snapchat gives users better control of their privacy than Instagram does, given that Instagram Stories have to stay public with a public account. This approach could change in the future, but it you have no problem leaving your main content public, then it makes sense for Stories to be public too. Instagram Stories are nearly a complete clone of Snapchat Stories that have been built to be integrated with the already wildly successful Instagram app. The interesting thing about Snapchat is that its ephemeral content sharing has made it known for being a much more intimate social platform where users can connect more closely with their friends. On Instagram, however, users easily rack up thousands of followers and follow just as many accounts back—making it a far less intimate way of using social media. One big problem with this new Stories feature is that people who follow hundreds or even thousands of users will have a hard time scrolling through the Stories feed to view only the Stories from the users they're interested in viewing. Overall, the implementation of Stories is a bold move for Instagram and one that we'll need to watch closely to see how it evolves while observing whether the majority of users will continue to use it after the "newness" of the feature wears off a bit. As for Snapchat, it's definitely not going anywhere anytime soon.